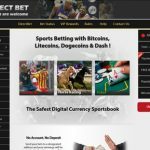 DirectBet offers an online betting platform that accepts cryptocurrency live bets for sports betting, horseracing, dice, and even poker. 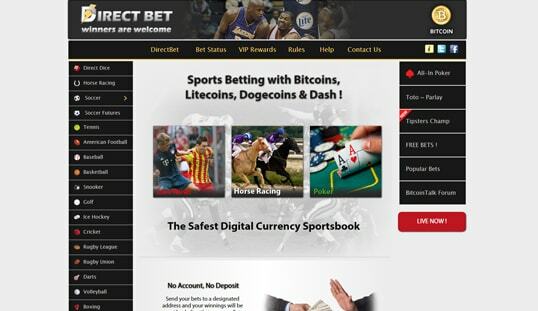 Boasting live bets in the safest and most secure environment, DirectBet propels its way closer to the top as the online sportsbook continues to win the hearts of cryptocurrency bettors. In 2014, this website became one of the brands that aimed to earn a market share in what seems to be a lucrative industry, both for the players and the operators. It is one of the newest Bitcoin sportsbooks online that offers numerous advantages, particularly instant betting and payout. Since then, it has expanded to include other games, including dice and poker. DirectBet features an extensive list of sports covered on its platform. From the international favorite football to the action-packed basketball, this sportsbook has everything covered. In fact, it even includes horse racing as one of the top sporting events that receive a great following online. Other than functioning as an online bookie, however, this gambling site also integrated other games, specifically dice and poker. Called Direct Dice, its version of the popular game dons a distinct interface and mechanics. Unlike the majority of Bitcoin dice in the market today, Direct Dice makes it simple, stripping off animations and focusing on the betting aspect instead. Poker is also available here. Just like the dice game, All-In Poker is provably fair and was developed to be different from the usual game variations readily available online. DirectBet also recently launched a new Casino & Playing Wallet. You can now play your favorite Casino games at DirectBet – Blackjack, Texas Hold’em, Jacks or Better, Slots, Roulette, HI – LO Switch, Heads & Tails, Baccarat, Virtual Horse Racing and more ! DirectBet uses its own software platform, thereby making it unique on the Bitcoin gambling scene. Despite its not being developed by the leading online casino software providers, it manages to deliver spot-on betting services without sacrificing the core features of Bitcoin—anonymous, instant, and secure. There is absolutely no need to sign up for an account because this gambling site prioritizes instant betting. 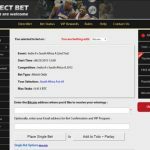 Thus, all bets are directly sent to the designated address for every game, and the winnings are automatically returned to the address used to send the wager. This creates a completely anonymous hub, which is advantageous in many ways. Granted that this sportsbook and casino does not require accounts, there is no option to make a deposit and withdrawal other than the bets placed and the cashouts paid. Bets are processed automatically while the winnings are delivered straight the user’s wallet almost instantaneously. A total of five cryptocurrencies are accepted here: Bitcoin, Litecoin, Dogecoin, DASH and Ether. 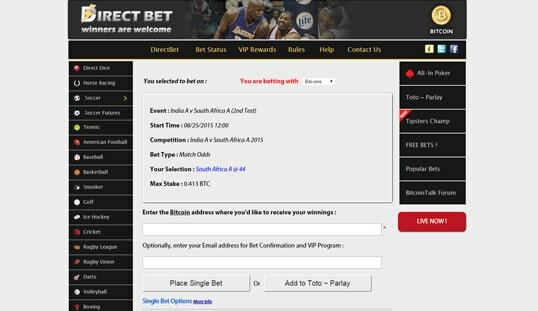 DirectBet has a simple and lucrative VIP program that allows everyone to receive 10 BTC every month just by placing bets on any of its games. 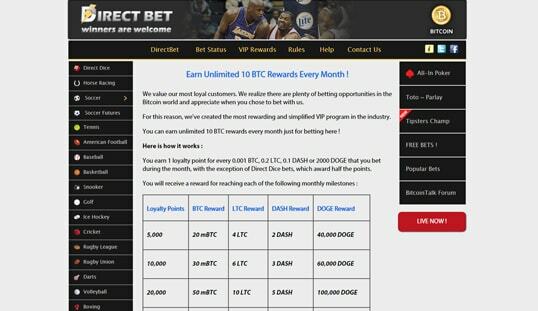 When enough loyalty points are collected, a corresponding DirectBet Bitcoin reward awaits the players. There are 10 levels in the structure, and each level reached by the player automatically rewards in BTC, LTC, DASH, DOGE or ETHER. The support team or the management can be contacted through the contact form on the site or by sending an email provided. There is live chat support, as well as phone support, so players seeking instant assistance would need to be patient in having their concerns attended to.